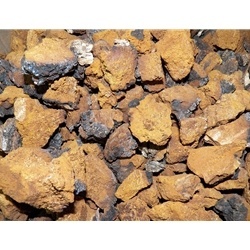 This chaga is from the United States and there are no chemicals or additives or pesticides. They are harvested in the wild. There is a lot of chaga from other countries in the United States. Ours are only harvested in the United States. We also carry chaga powder. To make the tea, heat 8-10 cups of water up slowly to 120F degrees and add 5 golf ball chunks to it, let sit on a low temperature for 6 hours or longer. If you need to boil your water because of where you live, allow the water to cool down to 120F degrees as to not damage properties of the Chaga. We use a water jug to store the chaga in the refrigerator. You can store the tea for 14 days. Drink 3 cups a day. It is good hot and cold, it has a very mild tea flavor, not mushroom flavored at all. These statements have not been evaluated by the FDA. They are for educational purposes only and are not intended to diagnose or treat any condition. Please consult your health care professional with any health-related concerns, and for diagnosis and treatment. It's hard to find whole Chaga mushroom. Excellent for preventing and treating disease. Have been treating my 83 year old father for cancer. He's in "Much Better" shape now. Thanks for offering Chaga...Richard T.